The Blue Diaper Syndrome is also known as the Drummond’s Syndrome or Tryptophan Malabsorption. It is a genetically inherited disease, rare in prevalence and can be acquired as autosomal recessive or an X-linked inheritance. It is characterized by excessive calcium present in the body, and deposition of calcium salts in the parenchymal cells of the kidneys. Besides, the gastrointestinal tract fails to metabolize tryptophan which is an essential building block of proteins due to the lack of two or more protein carriers. This leads to formation of “indican” that renders the urine of the infant blue in color. 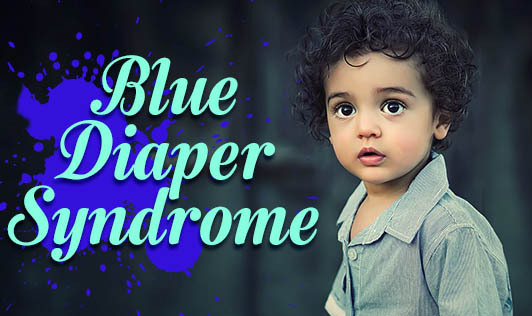 Infants born with the Blue Diaper Syndrome experience fever, irritability, digestive discomfort, and visual issues that can persist for a lifetime and become worse if not attended to. In severe cases, anorexia, vomiting, constipation, and failure to thrive can also result. A series of diagnostic tests to confirm the condition will be performed. It may include tests for cold and flu, hearing, apnea, infections, allergies, and kidney diseases depending on the symptoms. A low tryptophan diet must be practiced throughout life as that is the only treatment option available. Foods such as milk and milk products, egg, fish, meat, and nuts must be avoided. Since tryptophan is a protein builder, restricting tryptophan sources in the diet can in turn reduce protein intake and cause severe protein deficiency such as failure to thrive, growth retardation, deficiency of micronutrients as they depend on protein carriers for transport, and a weakened immune response. Hence, food choices need to be made wisely and children must be taught to do so at the earliest. Food labels must be double-checked and these foods must be kept separately right from the time you pick them up from any store to avoid mixing or pilferages. Supplements high in protein with no tryptophan present in it are also available and recommended to be consumed on a daily basis in calculated amounts as supervised by a dietitian.